I am notoriously adverse to wearing a lot of color, especially in the fall and winter. Aside from my most treasured, beloved and prized camel coat (which is technically a neutral as well), I usually just pile on layers and layers of black, navy, grey and white. 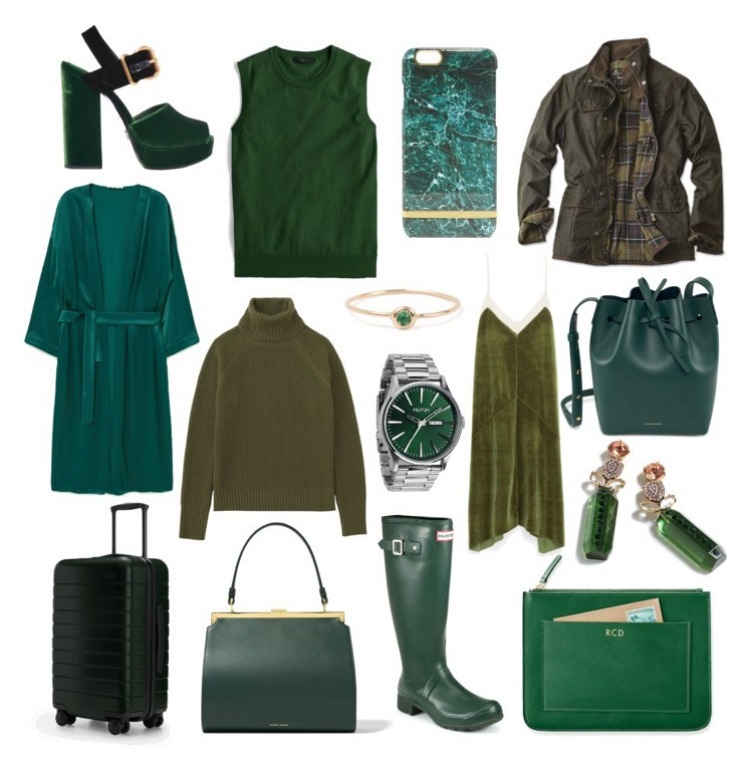 Blame it on the changing tides of fashion but I'm slowly warming up to the idea of infusing my cold weather wardrobe with a bit more color—mainly a rich, jewel-to-olive hue of green. I'll admit, I tried to avoid all this green at first. I have an olive green Barbour jacket (the timeless Beadnell, anyone?) and those classic green Hunter boots (now in a lighter, packable style!) and that felt like all I needed. That is until I started seeing Mansur Gavriel's new bags for fall. Their suede and leather bags in a deep moss green (mainly the 'Elegant' top handle bag) are just too good to resist. I could see them looking so so chic with an all-black outfit—just a little hint of something different that adds interest and character to your everyday uniform. One of the five rings I wear daily is a tiny gold band with a teeny tiny green stone—and I hardly even noticed how much I liked the color until, like I said, I started seeing green everywhere. I found a similarly dainty ring from Catbird for just $185 that has a tiny emerald stone in a round gold setting. And speaking of green stones—can we have a moment for these drop earrings from J.Crew? I love how feminine they are, they remind me of something Lady Mary might have worn on Downton Abby. Also at the top of my green list is this preppy, bright pouch from Mark and Graham. I love the monogram on the pocket, and could see it making the perfect companion for dinner dates or tucking into my tote for work. Additionally, I'm crushing hard on Away's collection of carry-on bags, and my favorite one just happens to be dark green. Below, I've rounded up my favorite green things, including J.Crew's perennially wearable Jackie shell (on sale!) and a cozy-looking olive green cashmere blend turtleneck from Uniqlo. (Oh and obviously this satin-y emerald green robe from Mango...) Now go forth and go green.